The company that I work for has a Christmas party every year for employees' children. I've wound up co-organising it this year and doing everything from booking an entertainer (who twisted his ankle the night before, luckily they sent a replacement!) to buying and wrapping presents for Santa to hand out to the kids. I was also tasked with getting some food from Tesco - sausage rolls and sandwiches for the kids, mince pies for the adults, that sort of thing - and decided this was also a good opportunity to do some baking. I bought this cupcake set from Wilkinson in the January sales last year, so it was reduced from £2 to just 50p. You don't get a whole lot in it - 16 cupcake cases and 16 cake picks, cardboard pictures of Christmassy creatures (Santa, snowmen, gingerbread men and reindeer) to stick into each cake. The cupcake cases are also very small - I am used to baking in muffin cases - which I thought would be ideal for small children. I wanted to find a Christmassy cupcake recipe that was still fairly plain, as I didn't think children would necessarily like sophisticated or strong flavours. I came up trumps in a little book from Marks & Spencer called Easy Cupcakes. The recipe is called Gold star cupcakes, as that is how they are decorated, but I liked the flavour of the cake itself - brown sugar and cinnamon. I adapted the recipe as I didn't use their decorating recipe and I also doubled the quantities. Preheat oven to 180C. Cream the butter and the sugar then add the egg. Then fold in the flour and cinnamon and a splash of milk to loosen the mixture. Spoon into cupcake cases. Bake for about 10 minutes- cakes this size won't take long, but if you make larger muffin-size cakes, give them a couple of minutes longer. I made a simple buttercream by creaming softened butter with icing sugar and piped the buttercream on top of the cakes. I only piped on a small amount because I thought small children might not want a lot of frosting and their parents would probably appreciate not too much of a sugar rush either! Finally I added the festive cake picks. This is a simple recipe but that's what I wanted for small children, and the brown sugar and cinnamon flavour does give a festive feel. I'm sending these Xmas cupcakes to Alphabakes - poor Ros will be overwhelmed with entries this month I think! The December challenge for Four Seasons Food is party and these cupcakes were made for a children's party. The challenge is hosted by Anneli at Delicieux and Louisa at Eat Your Veg. 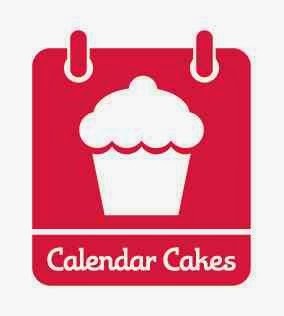 Calendar Cakes, hosted by Rachel at DollyBakes and Laura at Laura Loves Cakes has 'jingle bell rock' as its theme this month and so I will send them my Christmas cupcakes. I'm also sending this to Cakeyboi's Treat Petite as the theme this month is happy holidays, and these bitesized cupcakes fit right in. Finally I am sending this to the Spice Trail challenge as this month's ingredient is cinnamon. The challenge is hosted by Bangers & Mash. Love the combination of brown sugar and cinnamon and I'm sure the kids loved these! Thanks for entering AlphaBakes. Very very cute! I love these cupcake decorating packs. Thanks for entering them into Treat Petite!